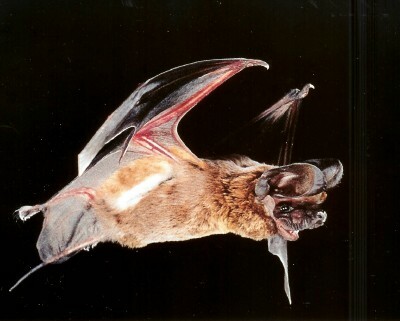 Description: The Big Free-Tailed bat (Nyctinomops macrotis) bats fur ranges from red-brown to dark brown and is the largest species in it’s genus (Nyctinomops). It has large broad ears and a wrinkle muzzle. Can grow up to 132 mm in length and weighs and average of 27 grams. About the Big Free-Tailed Bat: This bat is uncommon in Texas, found primarily in West Texas, mostly in high canyon walls only cracks. It has also been found in buildings. The females give birth to a single pup.